Don’t you hate that feeling, when you accidentally remove something from your phone and wish you could get it back? Well with the iPhone data recovery tool “EaseUS MobiSaver” this is possible. And best of all, you could try it for free. EaseUS MobiSaver is a simple to use program that works both on Mac and Windows. It allows you to find lost files on your iOS device with a single click of the button. All you have to do is connect your iDevice to your Mac or Windows PC and click “Scan”. When you start EaseUS MobiSaver you will see three different recover options to choose from. “Recover from iOS Device“, “Recover from iTunes Backup” and “Recover from iCloud Backup”. We are most interested in the first one. Once you click “Scan” the software will scan and analyse all the existing and deleted files. This might take a while, depending on the amount of files on your iDevice. If it takes to long you could “Stop” the scan to find the lost files from the current scan result. The best thing about this software is the detailed scan result. It organises Photos/Videos, Contacts/SMS and Reminders/Notes separately. It also gives you a preview, making it way easier to find your lost files. Once you found the lost files, click “Recover” and specify a folder on your computer to save the lost files. This user-friendliness makes MobiSaver the best data recovery software out there. Recovering lost files from an iTunes backup works exactly the same way. 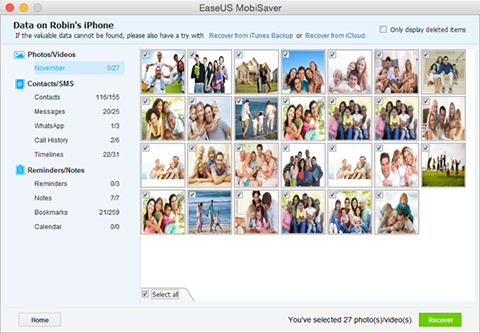 Once you start a scan you will see all the backup files of your iPhone, iPad or iPod that you have created with iTunes. When you recover files from an iCloud backup you need to fill in your iCloud account and password first. EaseUS MobiSaver can be downloaded for free for Mac and Windows. The full version of the software for Mac cost $79.95. The Windows version is temporarily available for $59.95.